One of the earliest cabalists; born 1240 at Saragossa, in Aragon; died some time after 1291. Very early in life he was taken by his parents to Tudela, in Navarre, where his aged father carefully instructed him in the Bible and Talmud. When eighteen years old his father died, and two years later Abraham began a life of ceaseless wandering. His first journey was to Palestine, whence he intended to start and find the legendary river Sambation and the lost Ten Tribes. He got no further than Acre, however, owing to the desolation wrought in the Holy Land by the last Crusades. He then determined to go to Rome, but stopped short in Capua, where he devoted himself with passionate zeal to the study of philosophy and of the "Moreh" of Maimonides, under the tutelage of a philosopher and physician named Hillel—probably the well-known Hillel ben Samuel ben Eliezer of Verona. Although he always holds Maimonides in the highest estimation, and often makes use of sentences from his writings, he was as little satisfied with his philosophy as with any other branch of knowledge which he acquired. He thirsted after the highest. He was of a communicative disposition, able and eager to teach others. He wrote industriously on cabalistic, philosophical, and grammatical subjects, and succeeded in surrounding himself with numerous pupils, to whom he imparted much of his own enthusiasm. On his return to Spain he became subject to visions, and at the age of thirty-one, at Barcelona, immersed himself in the study of the book "Yeẓirah" and its numerous commentaries. This book, and particularly the commentary and method of the German mystic, Eleazar of Worms, exercised a deep influence upon him, and had the effect of greatly increasing his mystical bent. 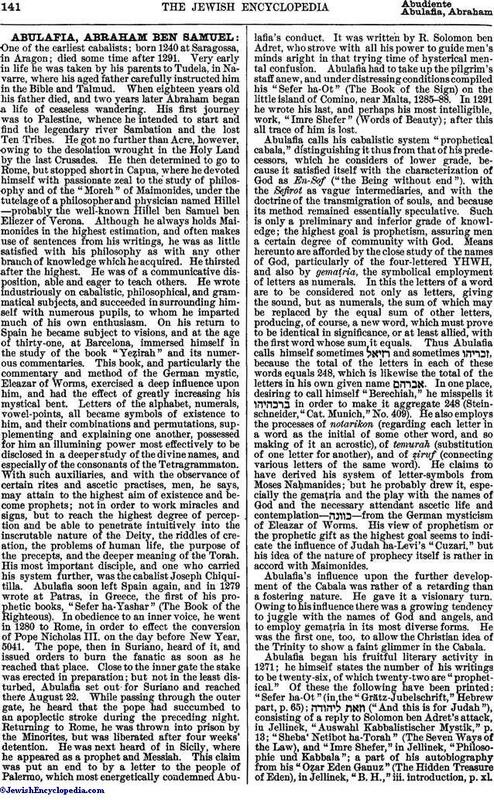 Letters of the alphabet, numerals, vowel-points, all became symbols of existence to him, and their combinations and permutations, supplementing and explaining one another, possessed for him an illumining power most effectively to be disclosed in a deeper study of the divine names, and especially of the consonants of the Tetragrammaton. With such auxiliaries, and with the observance of certain rites and ascetic practises, men, he says, may attain to the highest aim of existence and become prophets; not in order to work miracles and signs, but to reach the highest degree of perception and be able to penetrate intuitively into the inscrutable nature of the Deity, the riddles of creation, the problems of human life, the purpose of the precepts, and the deeper meaning of the Torah. His most important disciple, and one who carried his system further, was the cabalist Joseph Chiquitilla. Abulafia soon left Spain again, and in 1279 wrote at Patras, in Greece, the first of his prophetic books, "Sefer ha-Yashar" (The Book of the Righteous). In obedience to an inner voice, he went in 1280 to Rome, in order to effect the conversion of Pope Nicholas III. on the day before New Year, 5041. The pope, then in Suriano, heard of it, and issued orders to burn the fanatic as soon as he reached that place. Close to the inner gate the stake was erected in preparation; but not in the least disturbed, Abulafia set out for Suriano and reached there August 22. While passing through the outer gate, he heard that the pope had succumbed to an apoplectic stroke during the preceding night. Returning to Rome, he was thrown into prison by the Minorites, but was liberated after four weeks' detention. He was next heard of in Sicily, where he appeared as a prophet and Messiah. This claim was put an end to by a letter to the people of Palermo, which most energetically condemned Abulafia's conduct. It was written by R. Solomon ben Adret, who strove with all his power to guide men's minds aright in that trying time of hysterical mental confusion. Abulafia had to take up the pilgrim's staff anew, and under distressing conditions compiled his "Sefer ha-Ot" (The Book of the Sign) on the little island of Comino, near Malta, 1285-88. In 1291 he wrote his last, and perhaps his most intelligible, work, "Imre Shefer" (Words of Beauty); after this all trace of him is lost. Abulafia calls his cabalistic system "prophetical cabala," distinguishing it thus from that of his predecessors, which he considers of lower grade, because it satisfied itself with the characterization of God as En-Sof ("the Being without end"), with the Sefirot as vague intermediaries, and with the doctrine of the transmigration of souls, and because its method remained essentially speculative. Such is only a preliminary and inferior grade of knowledge; the highest goal is prophetism, assuring men a certain degree of community with God. Means hereunto are afforded by the close study of the names of God, particularly of the four-lettered YHWH, and also by gemaṭria, the symbolical employment of letters as numerals. In this the letters of a word are to be considered not only as letters, giving the sound, but as numerals, the sum of which may be replaced by the equal sum of other letters, producing, of course, a new word, which must prove to be identical in significance, or at least allied, with the first word whose sum it equals. Thus Abulafia calls himself sometimes and sometimes , because the total of the letters in each of these words equals 248, which is likewise the total of the letters in his own given name . In one place, desiring to call himself "Berechiah," he misspells it in order to make it aggregate 248 (Steinschneider, "Cat. Munich," No. 409). He also employs the processes of notarikon (regarding each letter in a word as the initial of some other word, and so making of it an acrostic), of temurah (substitution of one letter for another), and of ẓiruf (connecting various letters of the same word). He claims to have derived his system of letter-symbols from Moses Naḥmanides; but he probably drew it, especially the gemaṭria and the play with the names of God and the necessary attendant ascetic life and contemplation— —from the German mysticism of Eleazar of Worms. His view of prophetism or the prophetic gift as the highest goal seems to indicate the influence of Judah ha-Levi's "Cuzari," but his idea of the nature of prophecy itself is rather in accord with Maimonides. Abulafia's influence upon the further development of the Cabala was rather of a retarding than a fostering nature. He gave it a visionary turn. Owing to his influence there was a growing tendency to juggle with the names of God and angels, and to employ gemaṭria in its most diverse forms. He was the first one, too, to allow the Christian idea of the Trinity to show a faint glimmer in the Cabala. Abulafia began his fruitful literary activity in 1271; he himself states the number of his writings to be twenty-six, of which twenty-two are "prophetical." Of these the following have been printed: "Sefer ha-Ot" (in the "Grätz-Jubelschrift," Hebrew part, p. 65); ("And this is for Judah"), consisting of a reply to Solomon ben Adret's attack, in Jellinek, "Auswahl Kabbalistischer Mystik," p. 13; "Sheba' Netibot ha-Torah" (The Seven Ways of the Law), and "Imre Shefer," in Jellinek, "Philosophie und Kabbala"; a part of his autobiography from his "Oẓar Eden Ganuz" (The Hidden Treasure of Eden), in Jellinek, "B. H.," iii. introduction, p. xl.Jellinek, in his preface to "Sefer ha-Ot," says "In the Spaniard Abraham Abulafia of the thirteenth century Essenism of old found its resurrection. Preaching asceticism and the highest potentiality of the spirit through communion with God, effected by a perfect knowledge and use of His names, he was thoroughly convinced of his prophetic mission, and considered himself to be the God-sent Messiah and Son of God. He differs, however, from the Messiahs who have risen at different times in his many-sided philosophical training as well as in his perfect unselfishness and sincerity. He addresses himself not to the masses, but to the educated and enlightened, and does not confine his mission to his coreligionists, but is filled with the desire to extend it to the adherents of the Christian church also. It seems that, for the sake of influencing these, he tried to construct a Trinitarian system, though it was a Trinity in form merely, and did not touch the essence of God's personality. Before his vision stood the ideal of a unity of faith, the realization of which he longed to bring about. Imbued with this spirit, his disciples worked in Spain and Italy, emphasizing still more the Trinitarian idea while treating of the 'Ten Sefirot' in order to win the adherents of the Church. Hence the terms Father, Mother, Son, and Holy Ghost, borrowed from the Christian creed, in the cabalistic literature of the thirteenth century. In order to understand Abulafia psychologically and judge him correctly and without bias in the light of history, it must be borne in mind that his cradle was in Spain, the home of religious ecstasy, and that the age in which he lived was that of the Crusades, so favorable to mystic speculation, an age in which many longed to see the barriers separating Judaism, Christianity, and Islam broken down, and in which the Messianic hopes of the Jews found new nourishment in many hearts." Jellinek gives a list of Abulafia's works in the introduction to "Philosophie und Kabbala," p. 7; but it needs correction from Steinschneider, "Catalog," 2d ed., No. 285 et passim, Munich. Abulafia's writings are not wanting in excellent ideas and beautiful illustrations, but these are so overgrown with mystic obscurity and abstruseness that a perusal of them is not very edifying. Vogelstein and Rieger, Gesch. d. Juden in Rom, i. 247 et seq. (needs some emendation). (Abolafia): Author of "Shibḥe Tannaim" (The Praises of Tannaim), Salonica, 1872, a work glorifying the Tannaites. Talmudist, who lived in Palestine at the end of the eighteenth century. He held rabbinical posts in Safed, Larissa, and Smyrna. An extensive work from his pen on the Book of Commandments ("Semag" = "Sefer Miẓwot Gadol") was destroyed by fire in Smyrna. He was the author of some haggadic expositions which are to be found in the collection of rabbinical decisions, "Esh Dat" (The Fire of the Law), by Joseph Naḥmuli, Salonica, 1790. Several of his rabbinical decisions and sermons appeared after his death under the title "Nishmat Ḥayyim" (The Breath of Life), Salonica, 1806. Azulai, Shem ha-Gedolim, i. 54. Rabbinical authority; born in Palestine; died at Damascus, 1744. He was the grandfather of Ḥayyim ben David Abulafia and grandson of Isaac Nissim aben Gamil. Abulafia was a rabbi in Smyrna, where he instituted many wholesome regulations. In his old age he restored Tiberias. He is the author of several works: (1) "Miḳrae Ḳodesh" (Holy Convocations), Smyrna, 1729, containing treatises on Biblical and Talmudical themes; (2) "Yosef Leḳaḥ" (Increase of Learning), Smyrna, 1730-32, a work in three volumes on the Pentateuch; (3) "Yashresh Ya'aḳob" (Jacob Will Take Root), Smyrna, 1729; and (4) "Shebut Ya'aḳob" (The Captivity of Jacob), Smyrna, 1733, an elaborate commentary on the haggadic compilation "'En Ya'aḳob," by Jacob ibn Ḥabib and others (Steinschneider, "Cat. Bodl." col. 820). Chief rabbi of Jerusalem; born near the beginning of the nineteenth century, probably in Tiberias, Palestine; died at Jerusalem, Feb. 21, 1861. He was a descendant of Ḥayyim Abulafia (Fürst, "Bibl. Jud." i. 16, and "Zimrat ha-Areẓ" by Jacob Berab, son-in-law of Ḥayyim Abulafia, 1st ed., Mantua, 1745), who, at the invitation of Sheik Dahir al-Emir, came from Smyrna to Tiberias in the middle of the eighteenth century. Ḥayyim Nissim was chosen chief rabbi of Jerusalem, to succeed R. Isaac Kobo, in the fall of 1854, and was recognized as such by the pasha of Jerusalem, although, like his predecessor, he was not confirmed by the central government of Constantinople. He held the office for six years and four months, when he died. He left many works in manuscript, but as far as known none has been published. R. Abraham Ashkenazi was his successor. Luncz, Jerusalem Year Book, iv. 212, 213. For his epitaph ibid. i. 145-147. Rabbi at Aleppo, and author of "Pene Yiẓḥaḳ" (Isaac's Countenance), Smyrna, 1871. Rabbi; died at Safed, Palestine, at the beginning of the eighteenth century; father of Ḥayyim ben Jacob Abulafia and grandson of Jacob Berab. Abulafia was a pupil of Asbasan and a rabbi in Damascus. His rabbinical decisions are still extant in manuscript (Azulai, "Shem haGedolim," No. 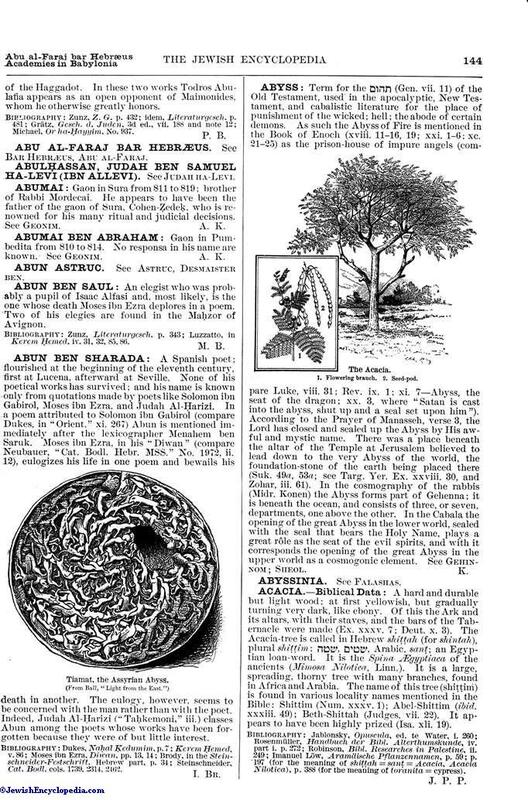 140; Ghirondi and Nepi, "Toledot Gedole Yisrael," No. 213). 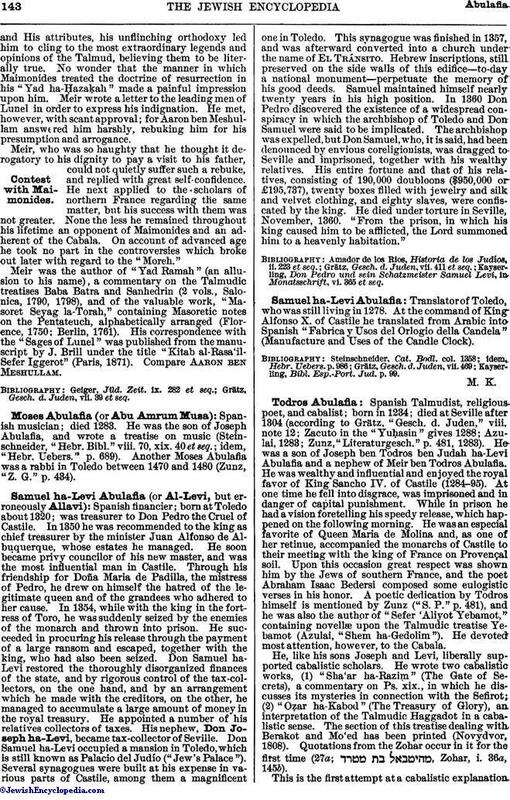 Spanish rabbi in Seville, Spain; died at Toledo, 1349. Spanish writer; lived in Talavera, and published a defense of Maimonides, which he addressed to the rabbis of Provence. Moses de Leon dedicated his book "Sheḳel ha-Ḳodesh" (The Shekel of the Sanctuary), 1292, to him (Zunz, "Z. G." pp. 433 et seq.). Spanish rabbi in Toledo, 1305. (known sometimes as Ramah = Rabbi Meir ha-Levi): Nasi and Talmudist; born at Burgos, Spain, about 1180; died March 29, 1244. He was the son of Todros ben Judah, to whom the physician Judah ben Isaac dedicated his poem, "The Conflict of Wisdom and Wealth," published in 1214. Meir, the schoolmate of Moses Naḥmanides, was so highly esteemed at Toledo that on his father's death in 1225 the latter's honorary title of nasi (prince) was applied to him. Although he did not hesitate to place interpretations of his own on Talmudic passages wherever they seemed contradictory to his idea of a perfect Godand His attributes, his unflinching orthodoxy led him to cling to the most extraordinary legends and opinions of the Talmud, believing them to be literally true. No wonder that the manner in which Maimonides treated the doctrine of resurrection in his "Yad ha-Ḥazaḳah" made a painful impression upon him. Meir wrote a letter to the leading men of Lunel in order to express his indignation. He met, however, with scant approval; for Aaron ben Meshullam answered him harshly, rebuking him for his presumption and arrogance. Meir, who was so haughty that he thought it derogatory to his dignity to pay a visit to his father, could not quietly suffer such a rebuke, and replied with great self-confidence. He next applied to the scholars of northern France regarding the same matter, but his success with them was not greater. None the less he remained throughout his lifetime an opponent of Maimonides and an adherent of the Cabala. On account of advanced age he took no part in the controversies which broke out later with regard to the "Moreh." Meir was the author of "Yad Ramah" (an allusion to his name), a commentary on the Talmudic treatises Baba Batra and Sanhedrin (2 vols., Salonica, 1790, 1798), and of the valuable work, "Masoret Seyag la-Torah," containing Masoretic notes on the Pentateuch, alphabetically arranged (Florence, 1750; Berlin, 1761). His correspondence with the "Sages of Lunel" was published from the manuscript by J. Brill under the title "Kitab al-Rasa'il-Sefer Iggerot" (Paris, 1871). Compare Aaron ben Meshullam. Grätz, Gesch. d. Juden, vii. 39 et seq. (or Abu Amrum Musa): Spanish musician; died 1283. He was the son of Joseph Abulafia, and wrote a treatise on music (Steinschneider, "Hebr. Bibl." viii. 70, xix. 40 et seq. ; idem, "Hebr. Uebers." p. 689). Another Moses Abulafia was a rabbi in Toledo between 1470 and 1480 (Zunz, "Z. G." p. 434). (or Al-Levi, but erroneously Allavi): Spanish financier; born at Toledo about 1320; was treasurer to Don Pedro the Cruel of Castile. In 1350 he was recommended to the king as chief treasurer by the minister Juan Alfonso de Albuquerque, whose estates he managed. He soon became privy councilor of his new master, and was the most influential man in Castile. Through his friendship for Doña Maria de Padilla, the mistress of Pedro, he drew on himself the hatred of the legitimate queen and of the grandees who adhered to her cause. In 1354, while with the king in the fortress of Toro, he was suddenly seized by the enemies of the monarch and thrown into prison. He succeeded in procuring his release through the payment of a large ransom and escaped, together with the king, who had also been seized. Don Samuel ha-Levi restored the thoroughly disorganized finances of the state, and by rigorous control of the tax-collectors, on the one hand, and by an arrangement which he made with the creditors, on the other, he managed to accumulate a large amount of money in the royal treasury. He appointed a number of his relatives collectors of taxes. His nephew, Don Joseph ha-Levi, became tax-collector of Seville. Don Samuel ha-Levi occupied a mansion in Toledo, which is still known as Palacio del Judío ("Jew's Palace"). Several synagogues were built at his expense in various parts of Castile, among them a magnificent one in Toledo. This synagogue was finished in 1357, and was afterward converted into a church under the name of El Tránsito. Hebrew inscriptions, still preserved on the side walls of this edifice—to-day a national monument—perpetuate the memory of his good deeds. Samuel maintained himself nearly twenty years in his high position. In 1360 Don Pedro discovered the existence of a widespread conspiracy in which the archbishop of Toledo and Don Samuel were said to be implicated. The archbishop was expelled, but Don Samuel, who, it is said, had been denounced by envious coreligionists, was dragged to Seville and imprisoned, together with his wealthy relatives. His entire fortune and that of his relatives, consisting of 190,000 doubloons ($950,000 or £195,737), twenty boxes filled with jewelry and silk and velvet clothing, and eighty slaves, were confiscated by the king. He died under torture in Seville, November, 1360. "From the prison, in which his king caused him to be afflicted, the Lord summoned him to a heavenly habitation." Kayserling, Don Pedro und sein Schatzmeister Samuel Levi, in Monatsschrift, vi. 365 et seq. Translator of Toledo, who was still living in 1278. At the command of King Alfonso X. of Castile he translated from Arabic into Spanish "Fabrica y Usos del Orlogio della Candela" (Manufacture and Uses of the Candle Clock). Kayserling, Bibl. Esp.-Port. Jud. p. 99. Spanish Talmudist, religious poet, and cabalist; born in 1234; died at Seville after 1304 (according to Grätz, "Gesch. d. Juden," viii. note 12; Zacuto in the "Yuḥasin" gives 1288; Azulai, 1283; Zunz, "Literaturgesch." p. 481, 1283). 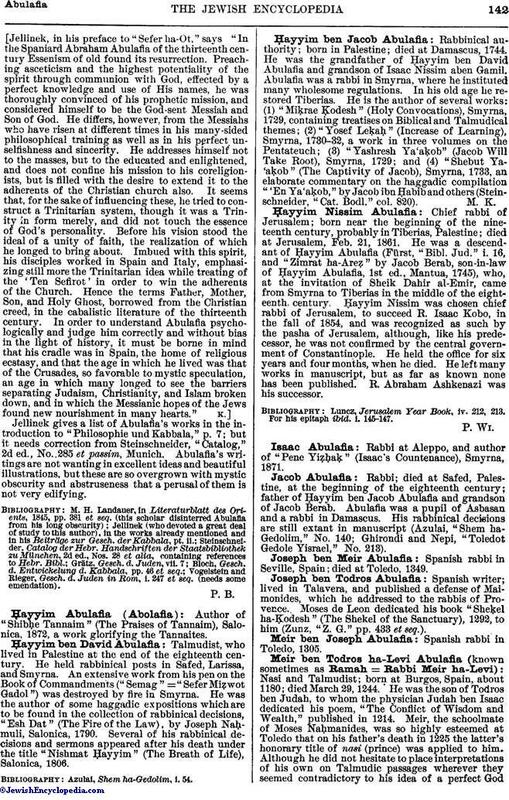 He was a son of Joseph ben Todros ben Judah ha-Levi Abulafia and a nephew of Meir ben Todros Abulafia. He was wealthy and influential and enjoyed the royal favor of King Sancho IV. of Castile (1284-95). At one time he fell into disgrace, was imprisoned and in danger of capital punishment. While in prison he had a vision foretelling his speedy release, which happened on the following morning. He was an especial favorite of Queen Maria de Molina and, as one of her retinue, accompanied the monarchs of Castile to their meeting with the king of France on Provençal soil. Upon this occasion great respect was shown him by the Jews of southern France, and the poet Abraham Isaac Bedersi composed some eulogistic verses in his honor. A poetic dedication by Todros himself is mentioned by Zunz ("S. P." p. 481), and he was also the author of "Sefer 'Aliyot Yebamot," containing novellæ upon the Talmudic treatise Yebamot (Azulai, "Shem ha-Gedolim"). He devoted most attention, however, to the Cabala. He, like his sons Joseph and Levi, liberally supported cabalistic scholars. He wrote two cabalistic works, (1) "Sha'ar ha-Razim" (The Gate of Secrets), a commentary on Ps. xix., in which he discusses its mysteries in connection with the Sefirot; (2) "Oẓar ha-Kabod" (The Treasury of Glory), an interpretation of the Talmudic Haggadot in a cabalistic sense. The section of this treatise dealing with Berakot and Mo'ed has been printed (Novydvor, 1808). Quotations from the Zohar occur in it for the first time (27a; , Zohar, i. 36a, 145b). This is the first attempt at a cabalistic explanationof the Haggadot. In these two works Todros Abulafia appears as an open opponent of Maimonides, whom he otherwise greatly honors. Michael, Or ha-Ḥayyim, No. 937.